Let’s kick off the summer with a plog! And what better way to celebrate Mother’s Day (a week in advance because we’re that eager) than by giving back to Mother nature herself. And with the date so strategically selected, why not have The Force push us thru this plog? 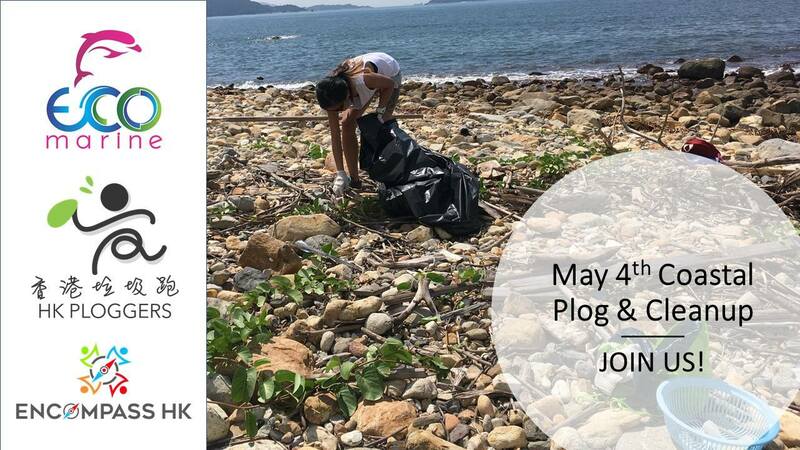 Eco Marine Adventure Cleanup, Encompass and HKPloggers are joining forces to host a coastal trail cleanup from Mui Wo ferry pier in South Lantau from 2:00pm to around 6:00pm. The route passes along many small beaches and areas clogged with polystyrene from the great typhoons of 2017 and 2018 which cause a threat to coastal wildlife as well as the beloved local buffalo and cow herds. Ploggers will jog/hike as a group or in a few groups for around 3.5km on fairly flat trail of easy to intermediate difficulty terrain with around 100m elevation gain whilst checking out the beautiful scenery and rubbish black spots. The group will then turn around and cleanup some of these rubbish back spots. The total distance of the plog will be around 7km with around 200m elevation gain. Do not fret, The Force welcomes all skill levels of hikers into the team – the more, the merrier! What to Wear: Hiking/Sports clothes and shoes. Long tights/trousers since we may be in plant undergrowth. Closed toed shoes only. Sun hat and other sun protection like umbrella and sunscreen. What to Bring: A reusable container with at least 1 L of water and some snacks if you are the hungry type. Single use plastic water and drink bottles like Bonaqua, Coke etc are prohibited. Try to minimize other single use food wrapping/packaging as well. Also bring sunscreen, mosquito spray and possibly a change of clothes. Eco Marine will provide gloves and rubbish bags. Feel free to bring your own gloves and tongs. Signup: click GOING by following this link to their Facebook if you will join. Disclaimer: By joining this event, all participants are deemed to have agreed to the terms and conditions contained in this disclaimer, and agreed to exonerate the event leaders, the organizers and any other participants in the event from any liabilities, claims, including but not limited to liabilities and claims as a result of any injuries or deaths or damages arising thereof. Volunteers joining the event are at their own choosing and at their own risk. About Eco Marine: Eco Marine envisions a society where nature and modern urban life thrive. Their mission is to inspire greater appreciation and guardianship of nature and to catalyze action for integrating this mindset into all aspects of contemporary urban life. Celebrate Earth Day! 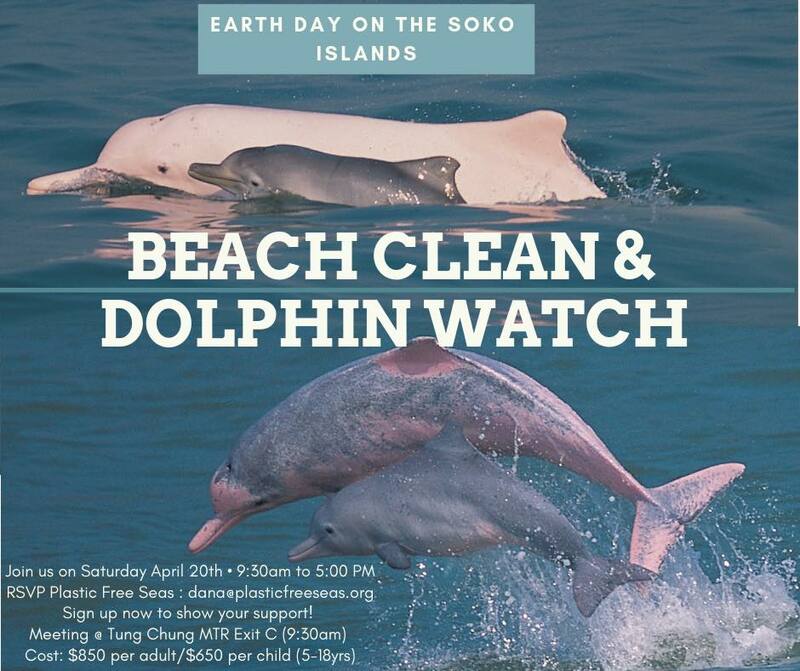 Head out to the Soko Islands to clean a beach and try spotting dolphins or endangered finless porpoises along the way. These environmental NGOs will discuss ideas for going plastic-free and creating a circular economy with you, so plenty to learn, stop plastic from entering our oceans, is there a better way to celebrate Earth Day? Email dana@plasticfreeseas.org for more details! About Ark Eden: Ark Eden presents Lantau Island as a living, world-class natural environmental wonder within China and Asia and suggests how its natural assets can be used to benefit education, local communities, Hong Kong residents and overseas visitors — all of us. Ark Eden aims to preserve the island’s ecological, geographical, historical and cultural heritage by following a sustainable lifestyle and by providing inspiring educational and eco-tourism opportunities for children, adults, residents and tourists. They do this through a series of integrated workshops, field trips and camps designed to lead every participant towards a better understanding of the environment and what everyone’s role is in conservation, preservation and sustainability. About Plastic Free Seas: Plastic Free Seas is a Hong Kong based non-profit organisation dedicated to advocating change in the way we all view and use plastics in society today, through education and action campaigns. The English Speaking Bauhinia Division of the Hong Kong Girl Guide Association (HKGGA) provides a Guiding experience to all girls in HK ages 7-15 whose medium of language is English. The Bauhinia Division follows the HKGGA programme, shares activities with HKGGA and is supported by HKGGA. Their 60 strong volunteer adult leader body and their girls come from all corners of the world. The English Speaking Girl Guides and Brownies of Hong Kong give girls a place where they can be themselves and share the experience of growing up as a girl in today’s world. 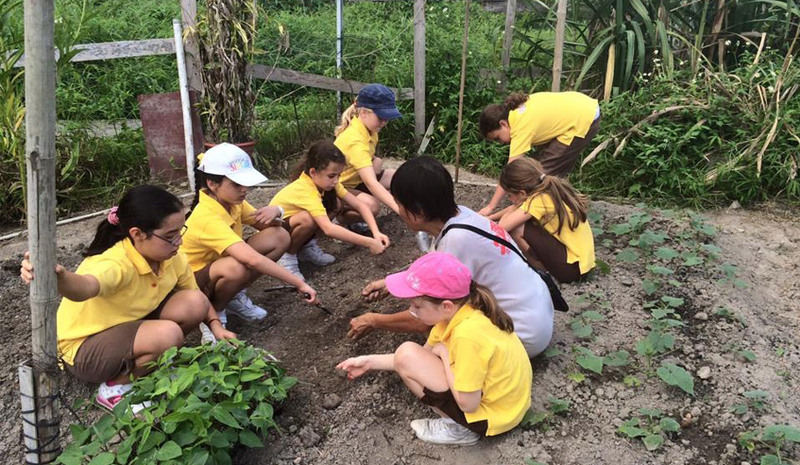 The English Speaking Girl Guides and Brownies of Hong Kong provides a safe, non-judgmental environment where girls can explore the issues they care about whilst having fun, enjoying new experiences and learning vital skills. Being a member of the Girl Guides builds a girl’s confidence, raises her aspirations and gives her the chance to discover her full potential, whilst becoming a force for good. 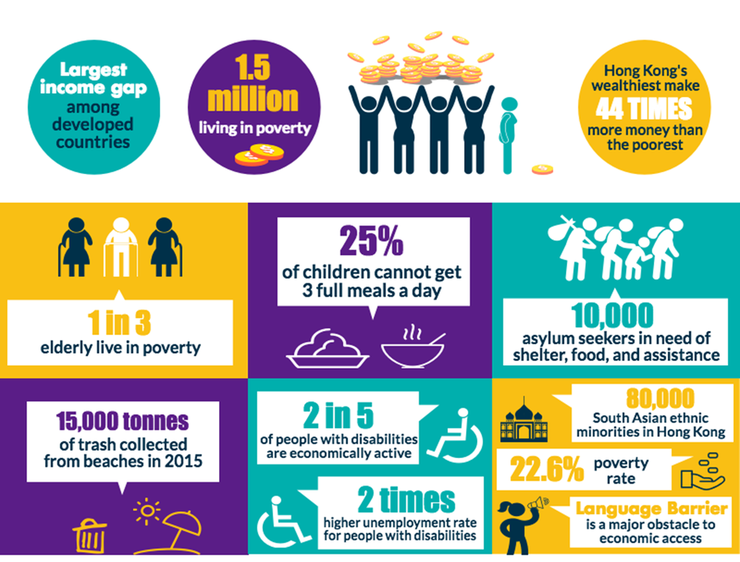 Volunteer: The English Speaking Girl Guides and Brownies of Hong Kong welcomes volunteers of all backgrounds, abilities, and faiths to join them as leaders. No previous guiding experience is necessary as they provide a full training scheme for all new leaders. Brownies and Guides can only do all the amazing things they can (think camping, hiking, star-gazing, outdoor cooking, inventing, performing, craft making…) with the support of their leaders, who plan, organise and run the weekly meetings. Plogging is a combination of jogging with picking up litter (Swedish: plocka upp). It started as an organised activity in Sweden around 2016 and spread to other countries in 2018, following increased concern about plastic pollution. As a workout, it provides variation in body movements by adding bending, squatting and stretching to the main action of running. Hong Kong has a huge trash problem, that is no secret. Whether you are traversing through a country park, relaxing at a beach or walking through the busy metropolis, it is impossible to avoid waste. Unfortunately, a lot of rubbish gets neglected until it is too late. Contrary to what many people may think, even waste in the city centre, through being washed into the gutter, can end up in the ocean. Waste Free HK and HK Ploggers’ goal is to avoid this scenario as much as possible through urban cleanups, making sure to leave places spotless. You will be plogging for approximately an hour and a half. You will meet at the Island School Tai Wai Campus in Sun Chui Estate, running around 8km, followed by a short group discussion. Reusable bags and gloves will be provided, however please feel free to bring your own. Participating in a plog, whether in the countryside or a busy urban area, could potentially lead to injury. HK Ploggers are not responsible for any injuries cause during runs, and individuals are responsible for themselves. If you have any underlying medical conditions, please make them known before the plog. You must have medical clearance from your doctor before you engage in any exercise program, and plogging is no different. It is not HK Ploggers‘ intent for anyone to get hurt or injured during their events. When you join a plog, you accept responsibility for all your injuries, illnesses, mishaps, including but not limited to the above items mentioned. When you attend an event, you waive and release HK Ploggers and any other co-organiser, their members and sponsors from all claims or liabilities of any kind arising out of your participation in any events. 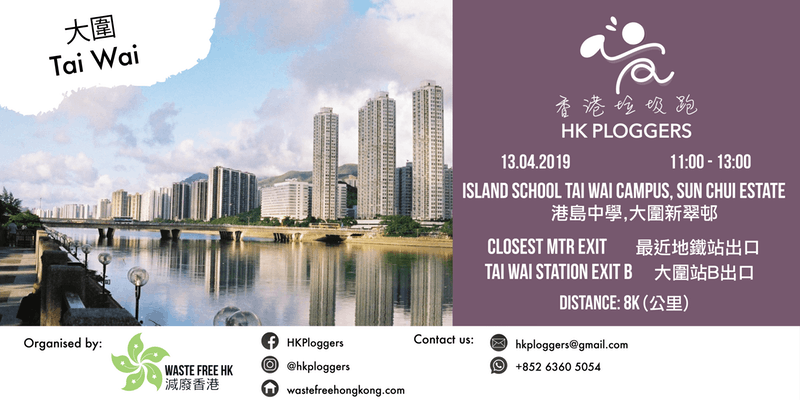 About Waste Free HK: Waste Free HK is an organisation aiming to promote a sustainable lifestyle through education, events and campaigning. Established in Early 2018, WFHK has begun organising various cleanup activities across Hong Kong, the first ‘Plastic Attack’ in the city with the aim of building a better relationship with major chains with the hope of stronger dialogue, as well as building a relationship with various government bodies with the goal of working together to reduce the waste issue blighting our beautiful city. Hong Kong has a huge trash problem, that is no secret. Whether you are traversing through a country park, relaxing at a beach or walking through the busy metropolis, it is impossible to avoid waste. Waste Free HK’s goal is to avoid this scenario as much as possible through urban cleanups, making sure to leave places spotless. This time you will be doing something different. A group hike across Lamma island, where you will then finish at a beach, clean up and have a little party. 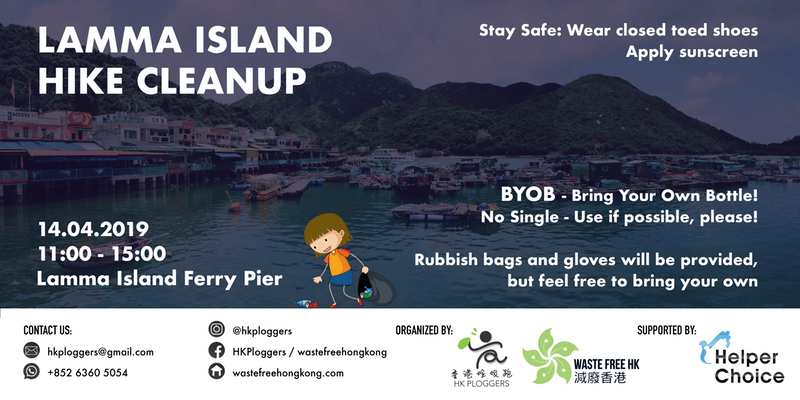 HK Ploggers and collaborating organisations are working with Helper Choice for this clean up event, which is an amazing organisation working connecting 200,000+ of employers and domestic helpers directly and ethically. This is not their first time working on a clean up event, and many of their members are amazing individuals. The event will begin at 11:00. There is a ferry at both 10:00 and 10:30 to Yung Shue Wan that takes you directly to the ferry. You will begin with your hike of the island, finishing up at the beach. Reusable bags and gloves will be provided to anyone who RSVP’s, however please feel free to bring your own. For those participating in a plog, hike or any other event organised by HK Ploggers and collaborating organisations, whether in the countryside or a busy urban area, could potentially lead to injury. HK Ploggers and its partners are not responsible for any injuries cause during events and individuals are responsible for themselves. If you have any underlying medical conditions, please make them known before. You must have medical clearance from your doctor before you engage in any exercise program, and plogging is no different. When you attend an event, you waive and release HK Ploggers and any other co-organiser, their members and sponsors from all claims or liabilities of any kind arising out of your participation in any events. Autism Spectrum Disorder (ASD), is a group of neuron-developmental impairments. People suffer from ASD usually shows different degrees of deficit in social interaction and verbal and non-verbal communication, repetitive and stereotyped behaviour, such as rocking back-and-forth, repeating others’ speech or with obsessive interest. Research indicates that the signs of Autism can emerge at the age of 18 months to the age of three, and, these symptoms, whether mild or severe, are incurable and could affect people for the rest of their lives. Founded in 1999 by a group of concerned parents, educators, and professionals, Rainbow Project is a local charitable organisation set up in Hong Kong. They provide English medium special education service, bilingual (English or Cantonese) occupation therapy and speech therapy to children (age 3 to 11) who are diagnosed with Autism Spectrum Disorder (ASD) and other special education needs. Aside from that, the Rainbow Project also conducts workshops and training at their learning centre and gives talks on Autism at mainstream schools to raise the awareness of Autism. 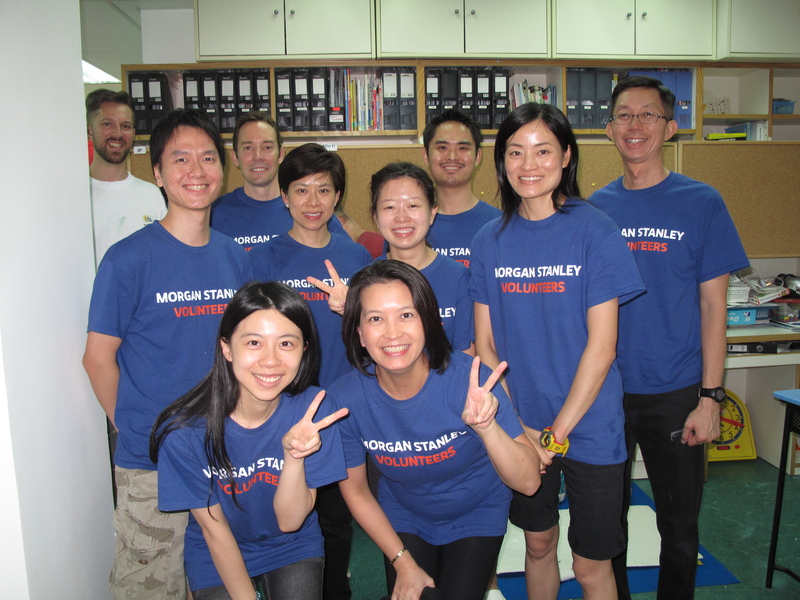 Volunteer opportunities: Rainbow Project welcomes volunteers to help them with various projects. Are you good at dealing with children and you want to help during a field trip? Do you know how to build or maintain a website and you have some spare time? Do you want to help Rainbow Project paint a wall or do you know how to fix a chair? Get in touch – Rainbow Project values the help of their volunteers as part of their community program to raise awareness of autism.